Last month I wrote a review of Q4OS which is a lightweight Linux distribution which closely resembles older versions of Windows. I received an email advising me to check out XPQ4. In essence XPQ4 provides a theme changer for Q4OS similar to the one used by Zorin. With XPQ4 you can change the look and feel so that your Linux distribution emulates Windows 2000, Windows XP, Windows 7 or Windows 8.1. This guide shows you how to get XPQ4, how to install it and adds a little bit extra to really make Q4OS look and behave like Windows XP. It is the perfect replacement for Windows XP users not quite ready to give it up yet. The XPQ4 software has been created to work with Q4OS so you will need to install that Linux distribution before you start. Q4OS is really very good and goes down as one of my picks for 2015 with its lightweight look and feel and its attention to detail. To get XPQ4 visit http://xpq4.sourceforge.net/. 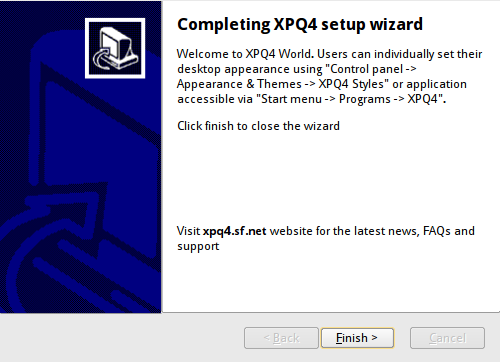 The webpage provides a download link and instructions for installing XPQ4. There are a number of download links available and it is important that you choose the right one. 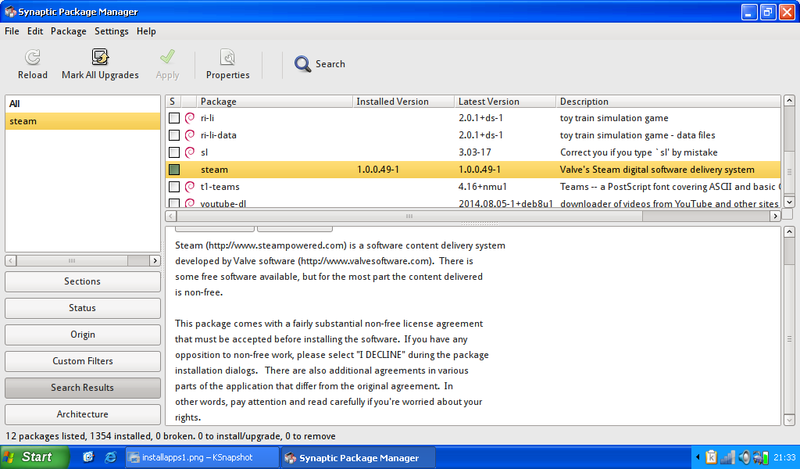 If you installed version 1.4 of Q4OS then you need to choose one of the download links associated with 1.4. 0.5 license free (same as 3 without the icons). For those of you that are interested there is also a link to the source code. First of all open the “My Documents” folder by clicking on the desktop icon or navigating via the menu system. Double click on the setup file for XPQ4. (It will be called something like “setup_xpq4_1.4_a1_i386.sh”). 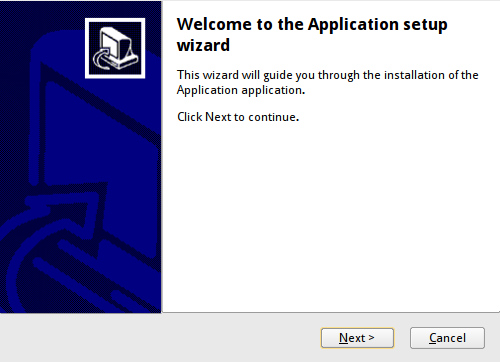 The application setup wizard will start. As a user, your part in the installation process is fairly visual without having to do that much. For instance the first screen checks that you are ok to install XPQ4. If everything passes you can click the “Install” button. A license agreement will now appear. Check the box to say you agree and click “Install”. The installer will now do the work of installing all the files required to make your system look even more like Windows than it did before. After the installation has completed you will get instructions showing how to change the look and feel. 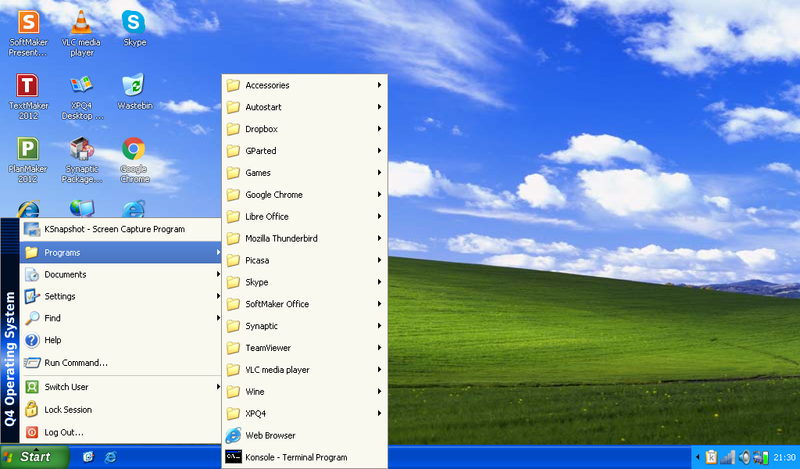 You can access the XPQ4 desktop styles application from the menu under programs -> xpq4. You will notice that Windows 8/8.1 is greyed out. This is because the theme isn’t quite complete. There is a check box that you can click which makes the option available but be aware that the final outcome is quite some way from Windows 8. To be honest though why somebody would choose a Windows 8 theme is beyond me. Even Microsoft have ditched it. When you click the “Apply Theme” button a message will appear asking you to confirm whether you are happy to be logged out in order for the theme to change. After you log back in the new theme will be displayed. I think that this is pretty much spot on. 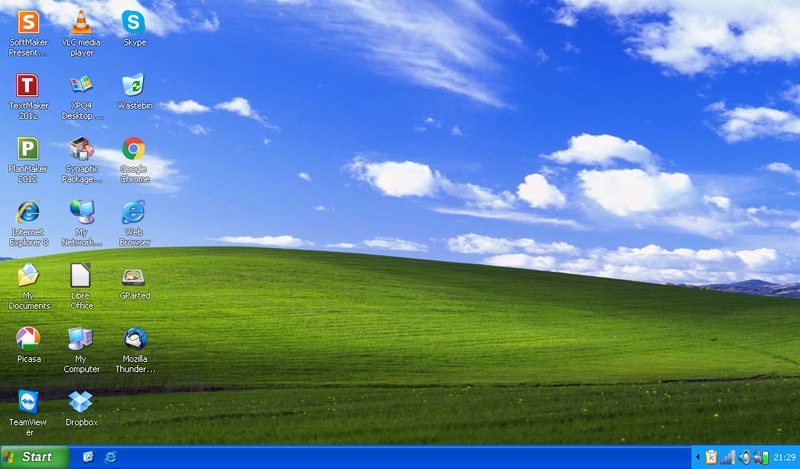 The wallpaper, icons and start button would be enough to make most Windows XP users feel at home. Even the menu has been themed well. 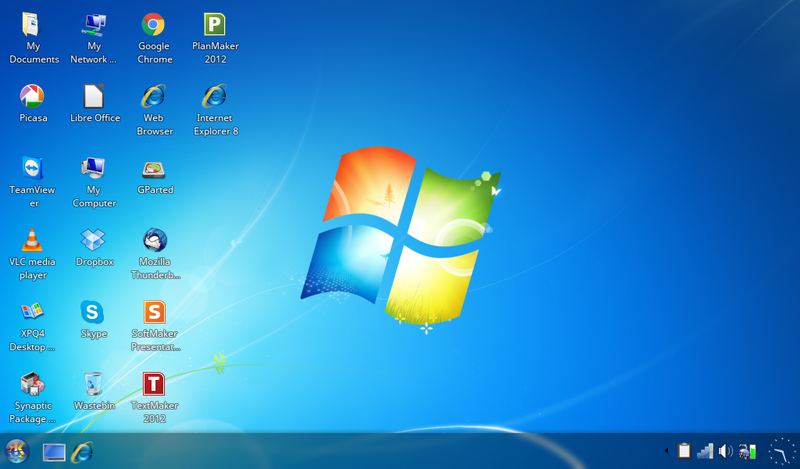 The Windows 7 theme isn’t quite as good and the menu doesn’t really emulate the Windows 7 look and feel. This section is more about Q4OS than XPQ4 but adds to the overall user experience. Q4OS has a software centre which provides a link to the Synaptic package manager and a list of commonly used applications. Using this tool you can install Chrome, Teamviewer, Skype, Dropbox, WINE, Picasa, VLC and SoftOffice. SoftOffice has a 30 day license after which you have to pay for the use of the software. You would possibly be better off sticking with LibreOffice. One application that is missing from the software centre is Steam. It is however available within Synaptic. Simply run Synaptic, search for Steam. Check the box and select “Apply Changes”. When you run Steam it will update by downloading 200 megabytes or so of updates and then you can login. The Internet Explorer symbol in the launch bar actually loads Konqueror which doesn’t really work that well. (A bit like Internet Explorer 7 really. boom boom). Something else that really isn’t a good idea but is possible is to actually install Internet Explorer 8. Using Synaptic install Play On Linux and click the “Install a program” link. Search through the list of programs and choose “Internet Explorer 8”. This is quite a big download as it gets the whole Windows XP image. After Internet Explorer has installed you can create an icon and drag it into the launch bar and all that is left to do is to remove the Konqueror icon. By The Way I really do not recommend doing this. Internet Explorer 8 has a lot of security issues. There used to be an advert on TV that said “It looks just like a Golf”, “It sounds just like a Golf”, “It feels like a Golf”. With the tag line being why not just buy a Golf. The same could be said for Windows. If you want Windows why not get Windows? Well we all know what has happened to Volkswagen recently. I bet all those people that bought the car that looks like a Golf without being a Golf are pleased about their decision. The same can perhaps be said about Windows. It is better to have a version of Linux that looks like Windows XP than to have a version of Windows which looks like Linux. Of course you might be considering a new computer in which case you might like to read my review of Windows 10. By the way, SoftMaker also offers FreeOffice, a free, unrestricted-use Office suite that *reads* 2007-and-later MS Office file formats (.docx, .xlsx, etc.). However, unlike the paid version, it will not *write* to them. By default it saves them as native SoftMaker file formats, or optionally as legacy MS Office file formats (.doc, .xls, etc. ).